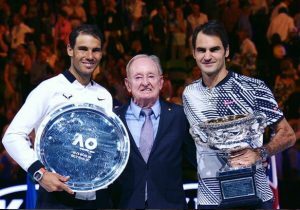 OJAI, Calif. (Feb. 6, 2017) – Considered tennis royalty and one of the greatest to ever play the game, tennis great Rod Laver has been named the 2017 Ojai Tennis Tournament Honoree. In addition to the Thursday night BBQ in Libbey Park, Laver will be honored at a special “Evening With Rod Laver” on Friday night. A fundraising event to benefit the Ojai Tennis Tournament, the event will take place at the Topa Mountain Winery. For more information and to purchase tickets online beginning on Friday, go to: theojai.net.